Lund Catch-It Floor Liner Carpeted Model preserves the original OEM carpet look and feel while protecting your feet from mud and liquids. Lund Floor Liners are manufactured and distributed by Lund International of Buford, Georgia, USA. Lund Int. was founded by Allan Lund in 1965 in Anoka, MN with the mission of leading the automotive accessories business in the development, production and distribution of customer centric accessories for trucks and passenger vehicles. Today, with over 400,000 sq. ft. of headquarters and distribution in Buford Georgia, and over 500,000 sq. ft. of manufacturing floor in Georgia and Texas, Lund Int. is a leading automotive accessories provider. You may recognize some of Lund Int. brands like Belmor (big rig truck accessories), AVS (window deflectors, hood protection and more) and last but not least Lund. The Lund Product Line includes running boards, tonneau covers, cargo management stuff, floor coverings and a lot of other neat goodies to spiff up your vehicle. But right now we are interested in the Lund Floor Coverings offerings, specifically the Lund Catch-It Floor Liners and Catch-All Extreme Floor Liners for passenger vehicles, big rigs(Class 8 trucks), pickups and SUVs. Note: In 2002 Lund Int. acquired Nifty Products, a manufacturer of custom molded floor mats, cargo bay trays, trunk liners and carpet mats. From this Nifty product line the modern Lund product line evolved. An info page, that has been superseded by this page, which describes the earlier Nifty Catch-All Floor Liner Product is found here. 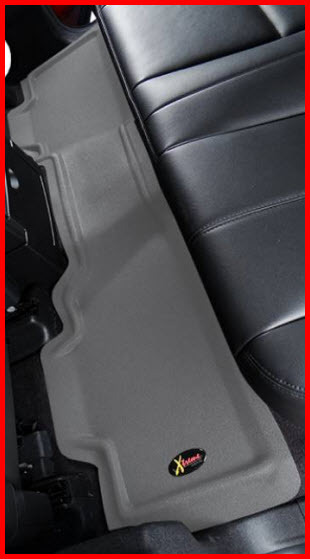 The Lund Catch-It is a vinyl (or carpeted) floor liner that is custom molded to provide a precise fit in your vehicle. It has raised edges along the perimeter to trap spills and dirt. Lots of nibs on the underside of the floor liner prevent it from slipping. And this floor liner may be available for big rigs, you know, big trucks like Freightliner, International, Kenworth, Paccar/Kenworth, Peterbilt, Sterling, Mack and Western Star. Not many manufacturers can claim those applications! The Lund Catch-All Extreme Floor Liner and its near identical twin, the Lund Catch-All Floor Liner are engineered using a custom molded design process to perfectly fit your vehicles floor pans in the front, 2nd row, 3rd row and cargo areas. 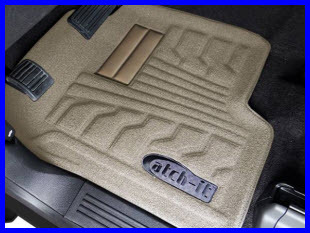 The Catch-All Extreme starts its life as a piece of vinyl that's designed to last the life of your vehicle, while the Catch-All is made from a luxurious vinyl carpeting that adds a certain plush feel reminding you of your factory installed carpeted floor mats. The Catch-All Extreme uses nibs on the bottom to prevent liner slippage while the Catch-All uses anchors to secure itself to the carpet on your vehicles floor so as it don't slip around. Catch-All Extreme Floor Liners also come in one piece units for the rear seating area floors. And these floor liners may be available for big rigs, you know, big trucks like Freightliner, International, Kenworth, Paccar/Kenworth, Peterbilt, Sterling, Mack and Western Star. Not many manufacturers can claim those applications.